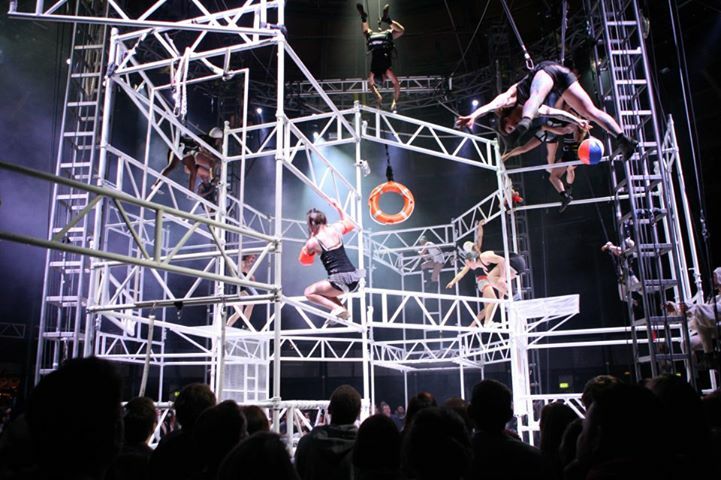 Despite touring in their own UFO-styled big-top, NoFitState have no traditional circus ring and tiered rows of seats, but instead allow the audience to move around and choose their own vantage points to watch the action, guided away from any potential collision by the circus’ trademark kilted and behatted ushers. As much as we are watching a physical spectacle, we are creating our own. As much as we are energised by the ever-changing live music from Fireproof Giant, we are energising the atmosphere in the tent itself by our own presence and reactions. And, as much as Firenza Guidi‘s direction provides a more playful way of looking at the world around us, so we are encouraged to question convention in our own behaviour. Critics who complain that a three-ring circus provides too much going on at once would no doubt level the same assessment at Bianco; for me however – torn from moment to moment between watching the focus act, the band, the perpetual rigging and de-rigging, or the human counterweights that allow the spotlit performers to rise and fall – a desire to return again is kindled, so that I can take in another angle, find details that I’ve missed. In the way that a good book can be revisited time after time, revealing something new with each rereading, so can a performance this densely populated with activity. After the tickets have been collected and the tent doors closed, what appears to be a pre-show prep act begins behind the gauze curtains that encircle the central area of the tent. I can’t help feeling that this would have been more effective if it had taken place as the audience were establishing themselves, rather than stretching on until we are impatient for something to jolt the show into life. Nevertheless, that jolt when it happens sees the audience and performers scurrying nervously together around the tent in the wake of four ingenious scaffolding towers that will transform into set after set as the show goes on. We settle around what begins as an exuberant synchronised swinging act on two central trapezes, but quickly becomes a fun competetive display of skills from Anne-Fay Johnston and Lyndall Merry (although, on this occasion, perhaps a little too competitive, as a couple of slips bring home the importance of the safety lunges used in the company’s swinging routines). Individuality is prized here and, even in the ensemble aerial acts that follow, there is no attempt at synchronisation. 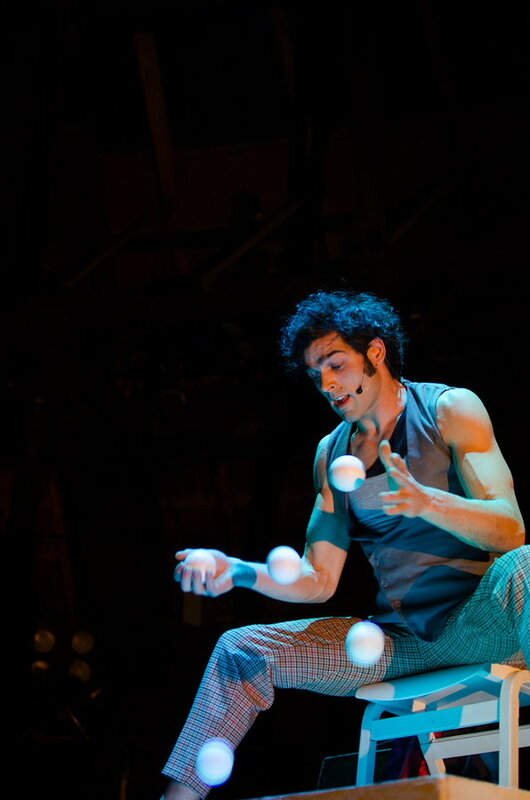 A slick juggling act from Hugo Oliveira, seated on a raised platform, appears effortless as he swiftly passes from one trick to another, seamlessly inserting extra balls until he reaches the magic seven. The range of tricks and juggling styles confound the small boy next to me, who keeps saying ‘Is he juggling yet?’, and keeps even the adults of the YouTube generation gripped and wanting more. Fred Rendell presents a cyr wheel act, dressed with girls on aerial hoops who are lifted and lowered as their counterweight counterparts clamber up and down the king poles that support the tent. Lee Tinnion instigates a joyful jungle-gym take-over, Ariele Ebacher leaps and dances across a wire, and August Dakteris‘ catlike grace belies his strength as he closes the first half with an aerial straps act to haunting accompaniment from the band. The acts are also interspersed with live and pre-recorded texts, some of which are clearer than others. Most of the mic’ed speech from aerialists is, unfortunately, unintelligible. Where the technical team shine is in the precise and perfectly shaded lighting design; one of the benefits of touring in their own tent rather than improvising around other venues’ limitations. During the second half, which opens with a lighthearted trampoline act that involves the entire company in a trip to the ‘swimming pool’, we also get a surprising Alice-In-Wonderland growing girl in Elena Burani. She then tumbles and climbs – up, down and across a series of ropes- with great style, before a comic and accomplished handstand routine from Johnston, and a confident cloud swing act from Freya Watson. Watson also presents a poignant doubles act with Merry on an aerial frame, which is tilted between the horizontal and vertical planes by the ever-present counterweight across the ring, and speaks a story of troubled romance. The conceptual premise of the show – change, transformation and new beginnings, based upon the multitudes we each contain – is not overtly apparent and, if you want to know how the show came about, you will need to read the programme. Some of the elements could have been copy’n’pasted from previous shows, and there are several sections which are underwhelming and over-long, more dance than circus, and less dance than objects suspended in the air looking pretty. But this is not traditional theatre; we are not here to be told a tale. Nor is it traditional circus; there is material here to provoke thought, as well as to amaze. Whilst being offered so much that is special, it seems churlish to point a finger at the failure points; the lack of polish and charisma in the transitional moments between acts seem to be a deliberate (if misguided) choice, characteristic of NoFitState, to remind us of our own humanity. As the tent is transformed into a tumultuous snow globe, encapsulating the frenzied dance trapeze of Sage Bachtler Cushman and an enraptured audience, the visceral power of Bianco reaches its zenith; despite the show’s rough spots, it’s not just the children grinning ear to ear as we make our way out through the foam to blink in the mundane light of the real world. Tagged as Bianco, Big Top, brighton fringe, Circus, contemporary, critique, Firenza Guidi, fireproof giant, no fit state, Performing Arts, review.